More than a few Israelis have been taking perverse pleasure in witnessing the struggles of the Argentinean football team in the world cup tournament in Russia. Considering their all-star line-up, the Argentinians were expected to make easy progress to the last 16 of the tournament. And yet, it was not quite how things turned out, even if they did finally achieve this objective. A draw against lowly Iceland, and a resounding loss to Croatia did not help their cause along the way. And the unceremonious dumping of the Argentinean team out of the tournament by France in the round of 16 has led many in Israel to consider this to be karma. The reason for the pleasure taken by Israelis in Argentina's poor performances, is because of the cancellation of the friendly warm-up match that was scheduled to take place between the national teams of Israel and Argentina just prior to the start of the world cup tournament. Even Israeli Defense Minister Avigdor Liberman jumped on the bandwagon by tweeting to congratulate Iceland on their efforts to restrict Argentina to a 1-1 draw. In this game, one of the world's most famous and decorated players, Lionel Messi, missed a penalty attempt for Argentina that could have won the game for his team. Liberman found it appropriate to link the unsatisfactory result for Argentina with the cancellation of their game against Israel. While Argentina's failures in this world cup tournament are difficult to conceal, it is a little disingenuous to claim that their poor form can be attributed to the cancellation of the warm-up game against Israel. And it is even more disingenuous to blame the Argentineans for the cancellation of this game. I believe that the blame for this can be laid fimly at the feet of the Israeli government, led by Prime Minister Netanyahu and Minister for Culture and Sport Miri Regev. The tradition of Argentina playing pre-world cup warm-up games against Israel goes back to 1986. In fact, after a warm-up game against Israel before the world cup tournament in 1986, Argentina went on to win the tournament. After a warm-up game against Israel in 1990, the Argentinean team faltered only at the final hurdle when losing to Germany in the final match of the tournament. So there are some who consider this warm-up game to be something of a lucky omen for the Argentineans. And apparently some who consider the cancellation of the game this year to be a poison chalice for Argentina's fortunes. In spite of all of the emotions surrounding the cancellation of the game, I consider the Argentineans to be entirely blameless for the fact that the game against Israel ultimately did not take place. The game was set against the backdrop of great efforts on the part of the Boycott, Divest, Sanctions movement (BDS) to bring discredit and damage to Israel in a public way. 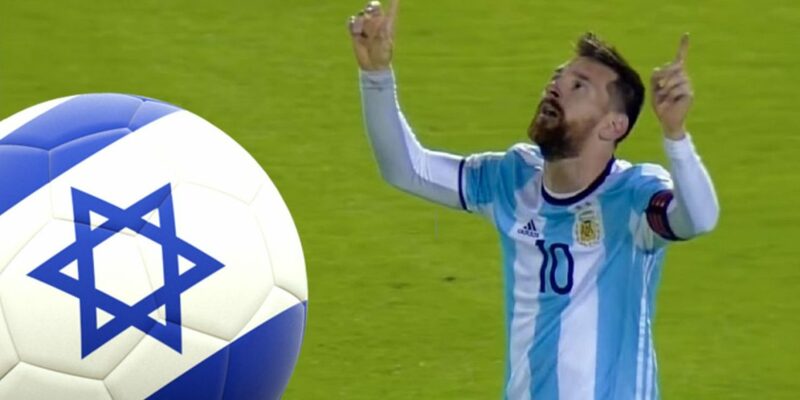 It was clear that the BDS movement was going to jump at this opportunity to put pressure on Argentina to cancel the game in order to use the chance to show that there is public opposition to Israel in every possible way. And BDS did not disappoint. What was disappointing, however, was the response to this by the Israeli government. The game was originally scheduled to be played in Haifa, and was billed as a friendly warm-up game. In precisely the same way that previous games have been played before. Sensing an opportunity to make something more of it, Minister of Culture and Sport Miri Regev succeeded in convincing the Argentineans to agree to move the game to the Teddy Stadium in Jerusalem, and to bill it as a game that formed part of Israel's celebration of 70 years of independence. Not only was this contrary to the original spirit of the game, it was a big mistake on the part of the Israeli government. It was essentially, the first step towards the ultimate cancellation of the game. I believe that the Argentinean Football Association would have been able and willing to withstand the pressure put on it by BDS and other anti-Israel protesters to allow this game to go ahead as planned in its original format. Once the game was given a much higher profile and billing and moved to Jerusalem to be part of Israel's 70th anniversary of independence, the Israeli government was inviting attention and ultimate disaster. In the process, it created a very difficult and unwelcome situation for the Argentinean Football Association. The record shows that so much pressure was placed on the Argentinean Football Association and its players, that they decided to call off the game. Players and their families were threatened with death if they chose to go through with the game. I condemn in the strongest terms the terrorists who think that it is OK to make death threats against the families of football players who are just doing their job in representing family, club and country. It is clear that these terrorists will stop at nothing in their attempts to bring about the destruction of Israel, even if it means threatening the lives of innocent people. Of course, their efforts will not succeed. My sympathy goes out to the Argentinean Football Association and players who were willing to agree to the friendly game in the first place, knowing full well that they would come under immense public pressure for their decision. I am sure that I would have taken the same decision to cancel the game as they took if I was in their shoes. Unfortunately, officials in the Israeli government could not sufficiently recognise the effort that friends of Israel are prepared to make by agreeing to play here, despite the obvious negative reaction that they would have to endure. Instead of lending a hand to support the Argentinean Football Association and its players to feel justified in proceeding with the game, apparently these same government officials felt that it would be appropriate to place even more pressure on our Argentinean friends by moving the game to Jerusalem, and giving it a profile that was never originally intended. Israel has every right and even a responsibility to assert its sovereignty, and to assert sovereignty over Jerusalem as its capital. But Israel also has the responsibility to pick its fights, and to choose the appropriate moments to assert this sovereignty. Israel also has the responsibility to support friends who are prepared to swim against the tide in supporting Israel when popular opinion may not necessarily do so. These things should not be taken for granted. The unfortunate reality is that the rules that apply to other countries do not necessarily apply to Israel. As much as it an unacceptable situation and one that we should all fight against with every fibre of our being, it is nonetheless the reality and cannot be ignored. It would be negligent for the Israeli government to behave in a way that simply ignores this reality. The cancellation of the football match was no victory for Israel, despite Miri Regev feeling that she stood her ground and asserted Israel's sovereignty. Besides denying Israel football fans the opportunity to watch talented footballers like Messi and his teammates, it handed a public relations victory to BDS. And it left the Argentinean Football Association wondering whether it is worth considering playing against Israel in the future given the unfortunate way in which the events unfolded. There was a significant lack of support coming from the Israeli government for them. Surely, the government has a responsibility to do what is ultimately in Israel's best interests? Sometimes it is better to be smart rather than to be right. The next test for the Israeli government is going to be the 2019 Eurovision song competition that is due to be hosted by Israel. There is already a strong body of international opinion that says that this competition should not be held in Israel next year. And BDS have moved into high gear to support them. On the other side, Miri Regev is on record saying that she would prefer the Eurovision not to be held in Israel rather than not hold it in Jerusalem. She may be granted her wish, in the same way as her wish for the football game was granted. Again, this will not be chalked up as a success for Regev nor for Israel. Being a person who holds strong views on many subjects, particularly on matters relating to Israel and the Middle East, this blog gives me the perfect forum to express my opinions. Feedback is always welcome. Please send me feedback or subjects that you would like to be discussed. I can be heard presenting the Israel Update each morning, Monday to Thursday at approximately 07:40 local time (05:50 GMT) on Radio Chai FM. Listeners in the Johannesburg area can tune into 101.9 fm, and listeners from elsewhere can hear the live feed on www.chaifm.com. Podcasts of previous broadcasts can be found on the Chai FM website. Is Ahmadinejad Trying to Prepare the Groundwork? Iron Dome - Blessing or Curse? Israeli Econcomic Links Behind the "Arab Curtain"